Are you a Coach or Player looking for cutting edge volleyball training? Discover the best articles for developing your volleyball skills and techniques. I love volleyball. I have learned a lot from my 25+ years experience playing, coaching, and officiating. Volleyball is a huge passion of mine and I'd love to share my passion with you. I'm on a mission to make a meaningful contribution to the sport of volleyball by providing the best volleyball training information. To accomplish this goal, I have put together a number of articles and videos that will help you become a highly skilled volleyball athlete. It is true that keeping your practices game-like is beneficial. There's no doubt about it. If you don't play in a real game situation, then you won't become better at playing in a game. But when it comes down to it, the best volleyball players all have one thing in common...the best mechanics. At the heart of the training controversy is "whole" vs "part" training. Here's an example of part training. 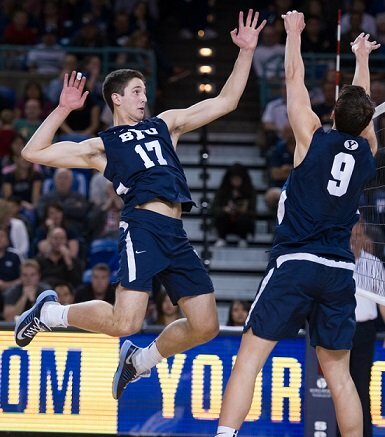 When teaching how to spike a volleyball, focus solely on the development of the armswing. Next, practice solely on the correct footwork. When each part is adequately developed, bring the two together. With "part training", the belief is that volleyball training is best if a skill is broken down and mastered in separate pieces. An example of "whole training" would be to start in the beginning by learning the entire spike approach (from first steps of the approach all the way to landing). While the athlete is performing the entire movement, the coach would then use "performance cues" to zero in on specifics such as placement of the steps and contact of the ball. Research has shown that "transfer of skill" is greater when the entire skill (the spike approach for example) is trained, rather than focusing on the mastery of the separate movements or "parts" of a skill. Most coaches tend to feel the more chaotic the play is, the better. And it's true, most athletes improve at volleyball by just playing the game. And it's easier to coach because there isn't a need for as much focus on the technical skills. On the flip side, there are coaches that train their players to be too robotic. Chaos forces an athlete to figure out how to solve problems. This is an opportunity for the athlete to be creative. This is when the athlete can "experiment" and get true volleyball playing experience. Without the experience of chaos play, the athlete won't be comfortable solving problems. However, I believe it's very important to focus on the mechanics. For most athletes, the sport doesn't come so naturally. They can't just go out and play a lot and end up a great player. The fact is, it takes a lot of time and hard work to become great. 1. Motor Programming. The game of volleyball is fairly chaotic. There's more game-skill transfer when practices are more chaotic (game-like). 2. Problem solving skills. Being creative is part of developing the skills of a great volleyball player. 3. Game-like play. Keeping things game-like prepares the athlete for real game situations. 1. This a time for a player to really learn and understand "good" skills are. 2. This an opportunity to get a "feel" of what it's like to perform a skill. Being able to "feel" yourself perform a skill correctly (and also feel it when it's incorrectly done) is extremely important. When an athlete has the awareness of what their body is doing, the athlete can make adjustments on their. No need for a coach! When a volleyball player decides to really focus on the mechanics, this is when the athlete can become a much smarter volleyball player. When a coach takes the time to teach the fundamentals of volleyball, this is when the player is given the opportunity to really become aware of their skills. Breaking apart a players mechanics helps the athlete become aware of their skills. The key is the athlete becomes aware of what they are doing. For example, let's say you have goofy footer on your team and you'd like to change her footwork. By breaking down the steps, the athlete is much more likely to "feel" the incorrect steps. Having the athlete try the steps in slow motion is even better. 1) Steven Bain, PhD. and Carl McGown, PhD. Motor Learning Principles and the Superiority of Whole Training in Volleyball. 2) Nixon and Locke (1973). Research on Teaching Physical Education. In the Search Box below, simply enter the volleyball term and hit the "search" button.